Ridley Scott when considering the direction of the design of the Engineer's environment said to Arthur Max, "I don't want it to be too Giger-y, but I don't want to give it all up either." 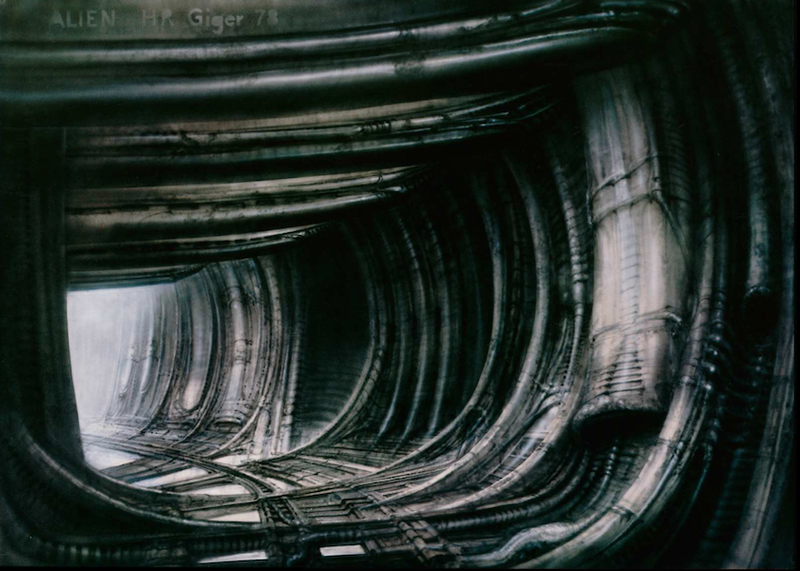 The art department looked at the design work that Giger had achieved for the first ALIEN film, in the form of archival files retrieved from Motion Picture Academy Library and from the personal collections of those who had worked on the first film. Ridley also screened some of the genres most definitive works. Arthur Max noted that he accumulated a lot of research based on the original movie and the whole series, whatever that meant. So they watched all of the movies including Alien and Blade Runner and three of movies with Star in the title. However this reference material was as much about discovering what not to do because they didn't want to repeat another film with this new movie of epic proportions from Ridley Scott. They wanted to be new and fresh because otherwise it would date film. 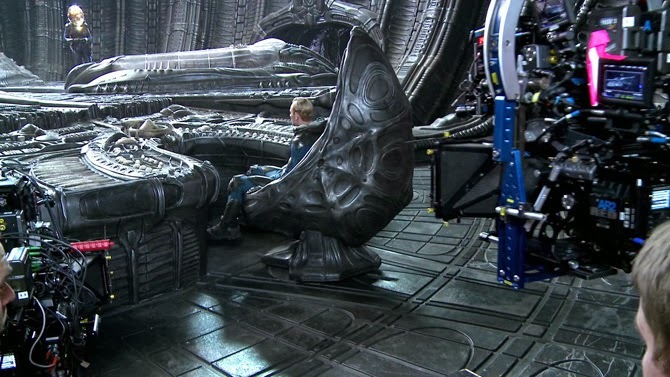 Ultimately the direction that they thought they would go with was the need to have something that seemed loosely reminiscent of Giger's work, to make it less biological in terms of the styling of Engineer's structures upon the the alien planet and to make it more mechanical. 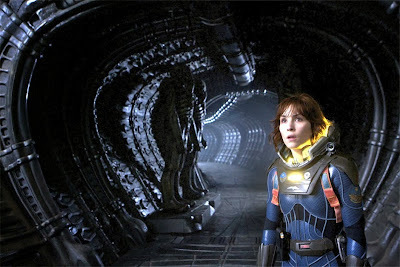 The people who inhabited this planet, called the Engineers, and their technology, is beyond anything that humanity is able to know or understand, (although it seem in the movie that their most advanced robots would suss out how to use it withing a period of minutes) but it has to be visually interesting. 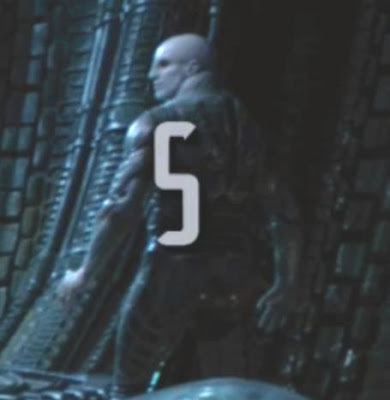 So this for Arthur Max was one of the hardest challenges because they had to compete with the most iconic science fiction ever and coming up with something to rival that was the real trick. Steve Messing when he designed the Juggernaut interior envisaged it being from the same world but not the exact same set and so the filigree on the designs was a bit cleaner and indeed less organic. He noted that Ridley would refer to the old Giger designs as "Pork Chops"
The flooring of the gangway of the old derelict ship was something rather makeshift, Giger was never so happy about the makeshift gangway anyway often referring to it as a "mineshaft" and one might even imagine that the way the walls were worked out, it looked as if the astronauts were walking through a row of giant fossilized pork chops. The ground of the place looked as if someone place a metal pipe or bar across from one side to the other of the passageway every few feet. Although they appeared to have worked some time adapting the lower part of the front of the derelict set in Alien to develop this corridor, Ridley Scott himself was not happy with the floor of the corridor, and so Steve Messing was informed that when they created it, he walked in there, that was what he saw and he couldn't do anything to change it. 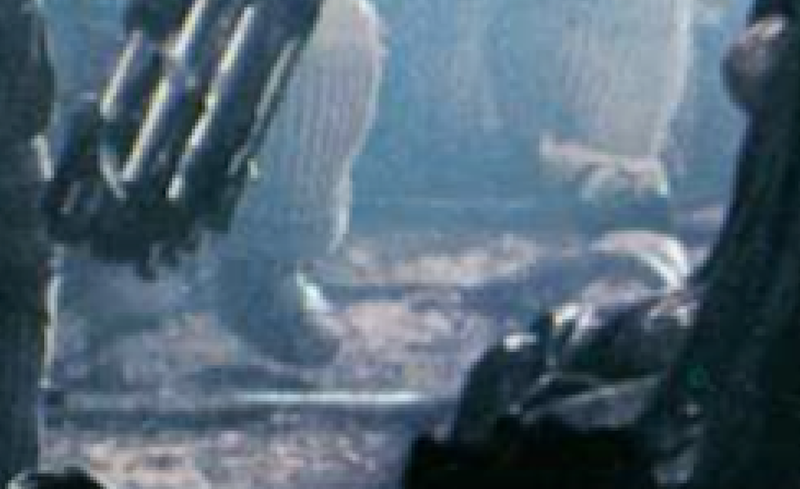 Steve Messing's floor for the Juggernaut, the ship that was related to the derelict from the Alien movie had a different look altogether. The biomechanic look was very basic in that they were a sort of floor patterned with grooves and grids radiating from the central deck on a flat floor reasonable for someone to be expected to walked upon. Perhaps a main difference here was that the derelict ship was built and piloted by a species that was not human and the Juggernaut was piloted and perhaps built by a species who were human like and required such a flat flooring. 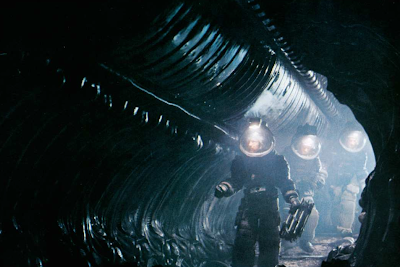 The result was something very plastic looking but as long as one wasn't holding everything under the close scrutiny that one looked at the designs of Alien, it was interesting. The 'engineer' race strongly reminded me of William Blake's vision of a super muscled humanoid entity, painted as God and many other classical characters in his oeuvre. I believe this imagery may have had some conscious or unconscious influence in the artistic design of these enigmatic and god-like creator aliens. Like Dr Manhattan with added super-race, Wagnerian overtones.